Percussive Arts Center teachers provide drum lessons in South Jersey and the greater Philadelphia region. Located in Cherry Hill, South New Jersey and just 10 minutes from Philadelphia, PA. The Percussive Arts Center provides drummers of all ages, backgrounds and playing levels a meeting place to study and talk everything drums. Founder Gary Jackere grew up in NYC where he studied with respected music educators, teachers and performers. Gary has been around drums for more than 45 years and is an active drummer, musician, educator, teacher and drum builder. Aside from providing a source for both drum teacher and student learning, the Percussive Arts Center (of Cherry Hill, NJ) features percussion equipment drum repairs, drum hardware repairs, drum tuning, custom drum sets, custom snare drums and drum refinishing / refurbishing services. Please click on the appropriate tabs to the left of the home page to learn more about these services . Gary is Teacher Integration Program Certified and member of the Professional Drum Teachers Guild. 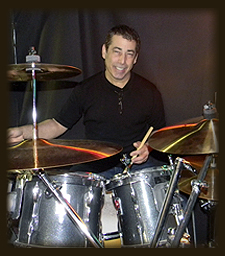 He teaches beginners, intermediate and advanced students of all ages to read and write drum notation (charts), play rudiments, chop building exercises to develop speed and endurance - employing proven techniques featured as Moeller method, Morello, Chapin and Igoe. Programs include the study of rock, jazz, and blues, Latin rhythms, 4-way coordination, single and double bass techniques, music theory song composition and much more. Regardless of the music the drum student is interested in playing, the fundamentals do not change. Our teachers make learning fun while challenging the student to develop and mature as a musician. Music lessons are designed to meet students' interest and abilities and adapted to help students strive to meet their goals and background in wide range of all proficiency levels, including students with special needs. 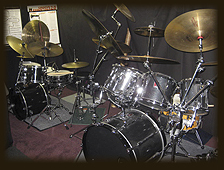 Subsequent to Gary’s course in music, he has worked for notable drum shops, music stores, studios, and drum companies, such as; Frank Ippolito’s NYC Professional Percussion Center, SIR Studios, Sam Ash Music, Samson Technologies, Premier Percussion-USA, and studied percussion building with the Late Al Duffy of Hinger Touch-Tone and Pearl Drum companies. These opportunities and experiences have contributed to Gary’s expertise in drum building and studies of drum sound technology. The Percussive Arts Center of South Jersey and Philadelphia features multiple drum sets allowing side by side drum lessons and utilizes video and audio recordings to aid both students and teachers as part of the learning process. Drum lessons, drum tuning and drum repairs are done at our location which is convenient to South Jersey and the Philadelphia area; including Cherry Hill, Haddonfield, Moorestown, Mt. Laurel, Marlton, Medford, Voorhees, Haddon Heights, Merchantville, Collingswood and Audobon, as well as serving the greater Camden, Gloucester, Burlington, Atlantic and Mercer counties.